"A remote lodge in upstate New York is the perfect getaway. . . until the bodies start piling up. It's winter in the Catskills and the weather outside is frightful. But Mitchell's Inn is so delightful! The cozy lodge nestled deep in the woods is perfect for a relaxing--maybe even romantic--weekend away. The Inn boasts spacious old rooms with huge wood-burning fireplaces, a well-stocked wine cellar, and opportunities for cross-country skiing, snowshoeing, or just curling up with a book and someone you love. So when the weather takes a turn for the worse, and a blizzard cuts off the electricity--and all contact with the outside world--the guests settle in for the long haul. The power's down but they've got candles, blankets, and wood--a genuine rustic experience! Soon, though, a body turns up--surely an accident. When a second body appears, they start to panic. Then they find a third body. Within the snowed-in paradise, something--or someone--is picking off the guests one by one. They can't leave, and with no cell service, there's no prospect of getting the police in until the weather loosens its icy grip. The weekend getaway has turned deadly. For some couples, it's their first time away. For others, it will be their last. And there's nothing they can do about it but huddle down and hope they can survive the storm." An Unwanted Guest was a thrilling read that kept me guessing until the very end! I just could not resist the premise of this book and am so glad that I didn't wait to read it! I'm a sucker for books that feature snowstorms and especially ones like this where the characters are cut off from the world due to the weather. 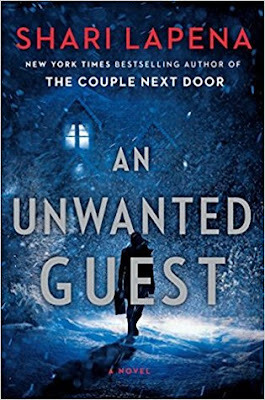 There is just something about a huge snowstorm that I just love....and when you add in a creepy mystery I'm completely hooked! One of the things that really caught my attention before I started reading this book was the comparisons to Agatha Christie's And Then There Were None. This is actually one of my favorite Agatha Christie books so that really put this book on my radar! And I can definitely see the comparisons. It's almost like this author was creating a homage to that book and Christie herself. She did an amazing job of creating a very similar vibe where you didn't know who to trust and what was really going on. That creepy, suspenseful vibe kept me reading this book late into the night because I just had to see what was going to happen next! I loved that I was kept guessing and changing my mind throughout the book on who the possible killer could be. It was just a very suspenseful read and I loved every minute of it! I don't want to say too much more than that because really this is a book just to be experienced yourself in my opinion. It's the perfect book to read this time of year and especially if you are due to get a winter storm yourself. Then you can thoroughly creep yourself out! Overall, I enjoyed my time with this book immensely! Was this book as good as Agatha Christie's? Well no, not in my opinion but then again I don't think you can really compare ever to Christie. It was a really great tribute (not sure if that's exactly the right word here but) to her book though and really great in its' own right! I don't usually rate books on here but I would give this one 4.5 stars easily! I found myself immensely satisfied with one part of the ending but I won't say more than that. I just enjoyed this book in general. I'm really looking forward to reading more by this author, and am glad that I have a couple more of her books to look forward to! Highly recommended! Bottom Line: A suspenseful thriller that kept me guessing! I'm so glad that I read this one! Yes, I liked this one quite a lot too. I'm always up for a 'locked room' mystery. That's one of my favorite plot devices. Oh this sounds good and I can't resist the comparison to And Then There Were None. It's one of my favorites too!